About forty mature Rounds of garlic were pulled and placed in the shed to dry. Each bulb has four cloves of reasonable size. This gives enough cloves for about 160 plants and I only need around 100. These will be planted in October 2017 to produce the main crop for 2018. I don’t remove the scapes, since I have found the bulbs get slightly larger if left on until harvest. I do not use the seeds from Rounds for planting for no particular reason. I will have plenty of seeds from the main crop, which hasn’t been harvested yet. 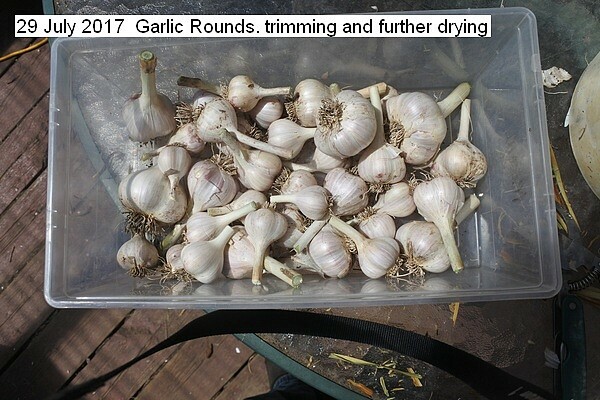 Further drying of the rounds which will be the cloves for the 2017/2018 garlic crop to be planted in October. 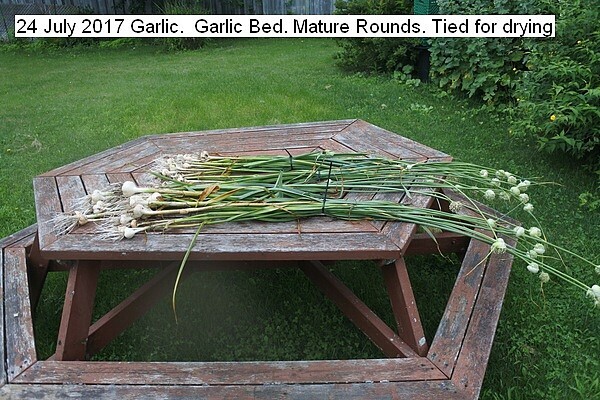 This entry was posted in Uncategorized and tagged 24 July 2017 Garlic Mature Rounds, Garlic Mature Rounds. Bookmark the permalink.